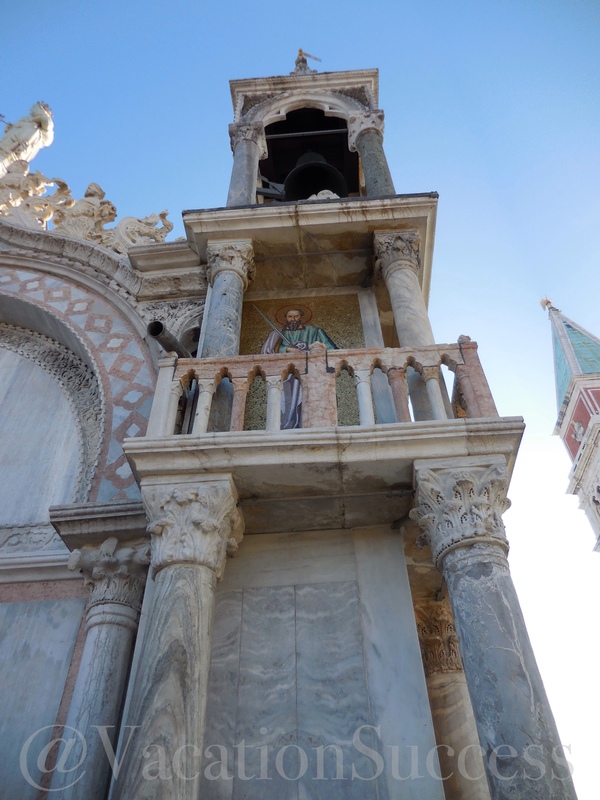 My most sincere advice for Venice – wander and getting lost. The West side of Venice feels completely different from the East side. There are four main bridges in Venice. Wander into dead ends. Follow the sounds of the school children playing at recess. Escape the crowds. Unless you are there during Cruise Ship season, then that will be impossible (sorry, Venice is a totally different city in the off-season. And the Venice we fell in love with was January Venice). Adding to our Must See Itinerary from an earlier post, we recommend planning a couple of days in the Ethereal City. Here’s hoping you have a beautiful sunny day. We headed straight to Piazza San Marco. Bought a cappuccino and croissant from a gelato/café on the square and found a seat on the elevated sidewalk that has to be used in the winter when the square floods. (Remember, Venice is sinking!). Depending on the line you see at the Basilica, we recommend you start your sightseeing there. Rick Steves book in hand, we headed up the narrow, narrow staircase and made our way through the self-guided tour. Rick Steves tour and map were a bit confusing, but still reliable enough to help guide you through this gilded beauty. TIP: If you need to carry a bag during your sightseeing, make it a small purse, not a backpack. They will make you check you backpack or large purse. But, a small handbag is allowed. And, if you packed smartly, that should be all you need for the day. Venice isn’t very big, you can always swing by the hotel mid-day for a nap and what ever you might need that doesn’t fit in your bag. Be sure to climb out the balcony doors about a third of the way into your tour of the Basilica before you go down to the worship floor and alter. From the balcony, you’ll stand side-by-side with the huge horse statues and overlook the Piazza. Its also the best place to view the world first digital clock. 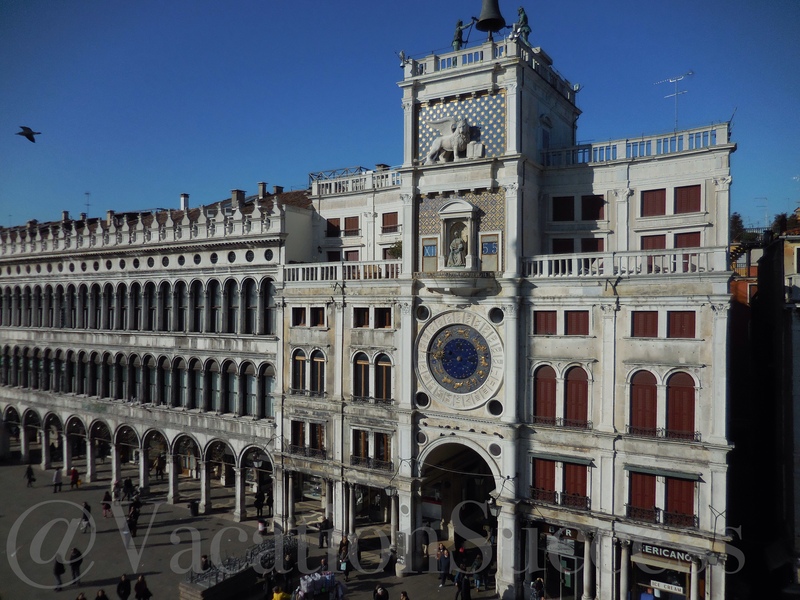 Look to your right, facing the piazza, to see the detailed clock and calendar used by the Venice merchants to manage their business. Imagine the importance of this technology and the vast number of fortunes run and built from this timepiece. The East-inspired chandeliers were my favorite architectural pieces inside the Basilica. Wish I had one hanging in my home. Brian’s favorites were the marble altar steps, worn with 500+years of sermons and ceremonies. Because this is vacation, we found ourselves a leisurely lunch somewhere off the square. The restaurants in Venice in the winter are limited, as its low season. And, Venice isn’t known as a culinary hub for Italy. So, just roll with it. Late afternoon on Day One, we walked back to Piazza San Marco to the Doge’s Palace. I liked the Doge’s Palace more than the Basilica. The architecture of the Basilica is much more interesting, but the history, power and story of the Doge’s Palace piqued our interests. Unlike our confusion with Rick Steves’ tour of the Basilica, his Doge’s Palace guide is spot on. He also has a podcast, that may be worth trying. Don’t rush your tour. We didn’t give ourselves enough time, and had to rush through the last few rooms of the tour before it closed. We only had an hour, but could have easily spent two. Dinner Day One was in a small bar, with only a handful of tables. We ordered with the locals, eating pasta with fish and little toasted breads with various toppings: greens, tomatoes, peppers, cheese, salami, and anchovies. Some were tastier than others, but all part of the experience. 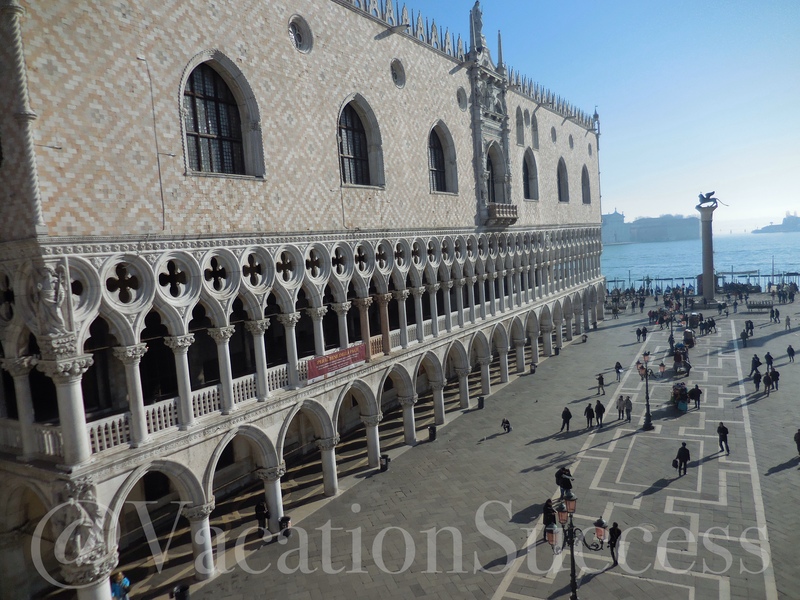 Click here for more of our Venetian Vacation Success in other posts.